Setout vs Outbreaker: Which Tortuga Daypack is Right for You? TL;DR: The Setout Packable Daypack, which launches this spring, is a lightweight, packable daypack ideal for use as a personal item or for a day of sightseeing. It differs from the Outbreaker Daypack in a few key ways. At first glance, the Outbreaker Daypack and Setout Packable Daypack might look similar. They’re both black, both relatively small, both lightweight… so what’s the difference? The Outbreaker Daypack safefly carries a computer. The Setout Packable Daypack does not. We designed the Outbreaker Daypack (pictured above) to be as light and slim as possible without sacrificing the strength and comfort needed to carry a computer. Laptops are heavy, and have pesky corners that wear through fabric if that fabric is not designed to support the weight. In order to maintain durability, we used an ultra-strong waterproof sailcloth for the Outbreaker Daypack. It’s a tough material that allows you to carry a computer without ruining the bag. To maintain comfort, even when you’re carrying a heavy laptop, the Outbreaker Daypack has Ariaprene shoulder straps and back panel. Ariaprene isn’t bulky, by any means, but it is a thicker, softer padding than you’ll find on most lightweight daypacks. It’s a powerful foam that keeps your shoulders comfortable during a full day. The Setout Packable Daypack, pictured below, is made from a much lighter fabric (30D ripstop nylon) with air mesh back panel and shoulder straps. It’s designed to be the perfect blend of ultralight and comfortable. The Setout Daypack will carry your essentials for a day of sightseeing, but it doesn’t have a laptop sleeve. We don’t recommend trying to carry a computer inside of it. As I noted in the previous section, the Outbreaker Daypack is made of waterproof sailcloth, while the Setout Packable Daypack’s main body fabric is a 30D ripstop nylon. The names of the materials are somewhat of a spoiler here. Waterproof sailcloth is, unsurprisingly, waterproof. The Outbreaker Daypack also uses coated, weather resistant YKK zippers for even more protection. The entire bag is not technically waterproof, but it is highly weather resistant. I’ve carried my laptop inside of my Outbreaker Daypack through countless NYC rainstorms without worry. 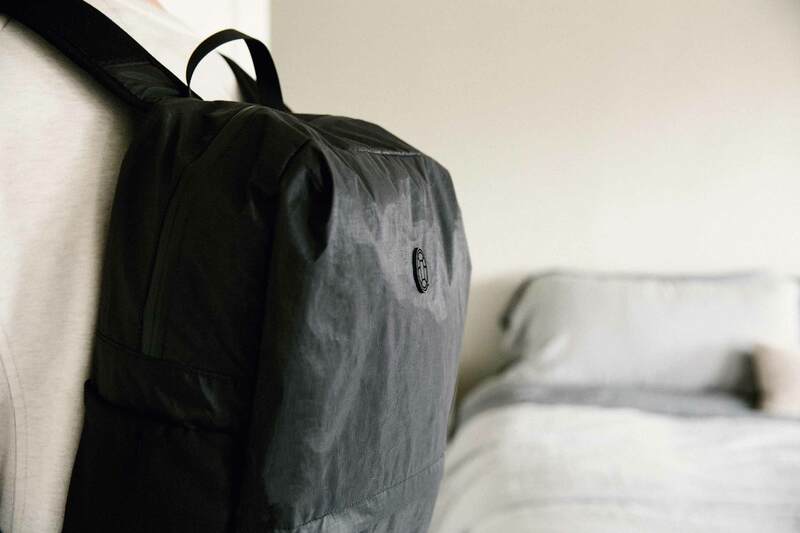 The Setout Packable Daypack’s fabric is treated with a durable water resistant (DWR) coating. DWR will keep you protected for a little while, but it won’t repel torrential rain. The Setout Packable Daypack is therefore somewhat weather resistant. We designed both daypacks to pack inside a carry on for one bag travel. How that happens differs between the two. The Setout Packable Daypack is designed with packability as a primary benefit. 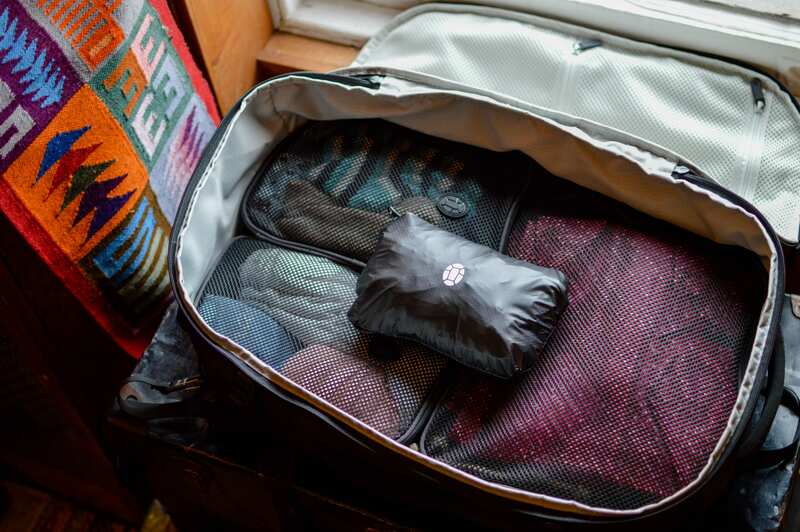 It packs into its own front zippered pocket and won’t take up much space in your carry on. The below image shows the Setout Packable Daypack in its “packed” state inside the Setout Backpack. Since the Outbreaker Daypack uses waterproof sailcloth, which is a stiffer fabric, it packs flat instead of packing inside of itself. They’re both designed to stow away for one bag travel. Setout packs down the smallest. While both daypacks are designed to be as lightweight as possible, the Outbreaker Daypack has an additional benefit that comes at the expense of weight: the ability to carry a computer. At 17.6 oz (1.1 lbs) the Outbreaker Daypack isn’t heavy; in fact it’s very light for a computer bag. Since the Setout Packable Daypack doesn’t have the same constraints, it’s even lighter: 8.5 oz (0.53 lbs). It depends on how you want to use it. If you want to carry a computer in your daypack, perhaps to work from a cafe during a day of travel, opt for the Outbreaker Daypack. 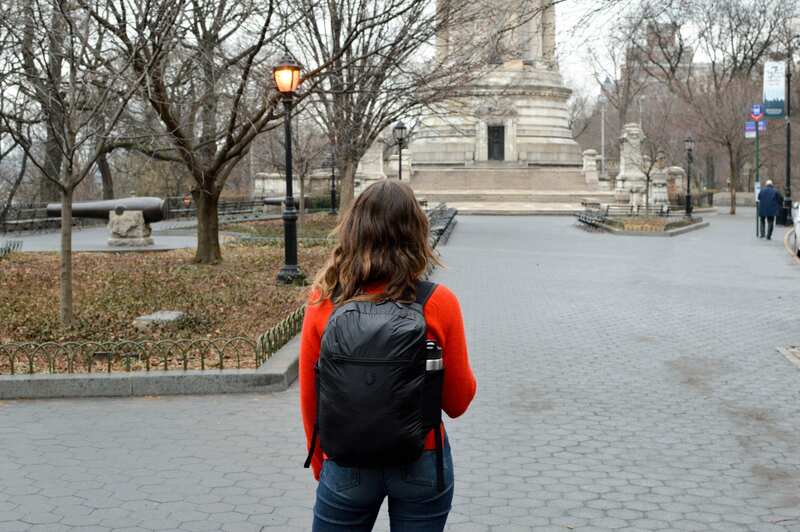 If you plan to carry your daypack while exploring a new city but don’t need to use it for electronics, the Setout Packable Daypack is probably right for you. The Setout Packable Daypack launches in April. If you want to be among the first to know when it’s here, sign up below. We’ll send you a carry on packing list as a thank you.